How places come to be is always interesting to me. Omaha’s Henry Doorly Zoo definitely has a history! First there was a park formed by the city of Omaha through condemnation proceedings on area properties in 1894. Over 100 hilly wooded acres were set aside for what officially became Riverview Park Zoo. In a short span of only four years, 120 animals were park residents. 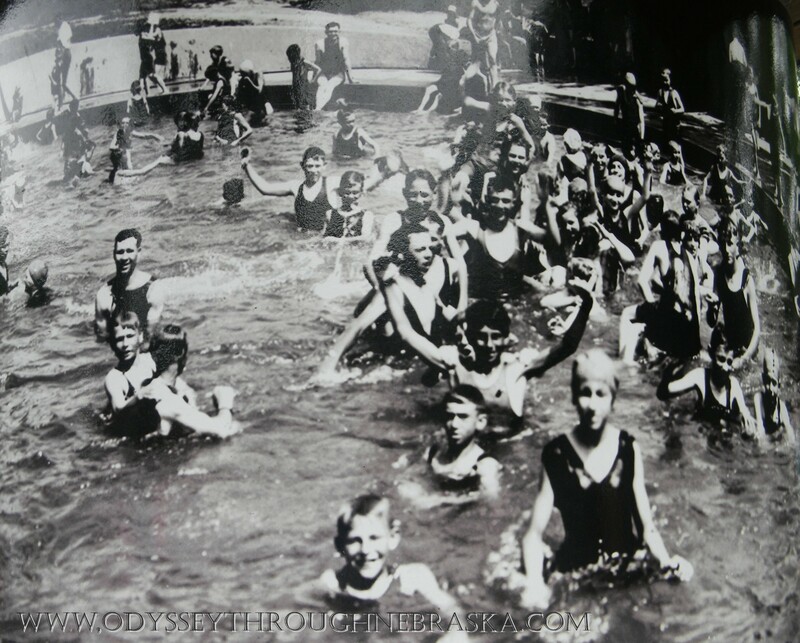 In 1916, the park added another feature as the Riverview Pool quickly became a place for refreshment in Omaha. For about 34 years, the pool was open to patrons. Then the polio epidemic began and going out in public areas scared families away. Covered over in 1944, the pool was almost forgotten. Unfortunately the story behind the pool is gradually fading away. Hopefully they will fix this, so that patrons can continue to appreciate the past life of the pool. Around 1970 the buried pool was given a new life. Mentioning to the caretaker his plans for a sea lion pool, the current Henry Doorly Zoo director was startled to learn a bit of history that had been set aside. Rather than building a new swimming area, the caretaker suggested that he simply unearth the pool that was already there. 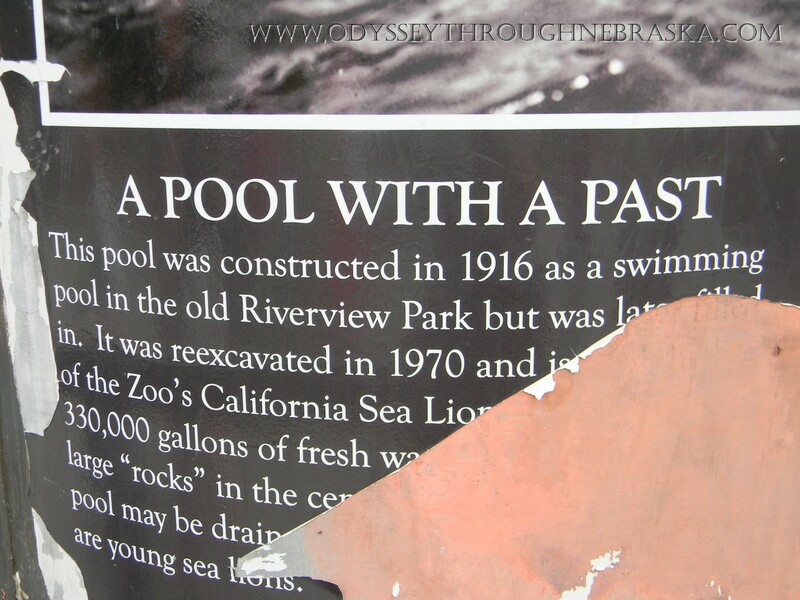 This once enjoyed pool became a new home for the sea lions. The sea lion pool in 2014. Despite what my children think, I was not around when this happened. While I do remember loving watching the sea lions frolic and play in the pool when I was a child, this process was before my time. Exactly how much of the original pool remains is a bit of a mystery, but the pools are definitely on the same site. I appreciate the fact that they are trying to preserve parts of Omaha history. A special thank you to Omaha’s Henry Doorly Zoo for their assistance in this story. All other references that I used can be clicked on above. To learn more about early Omaha parks, you can read the Nebraska Historical Society’s PDF on the History of Omaha Parks & Rec. Sometime later this summer I will be doing a longer feature post on Omaha’s Henry Doorly Zoo. 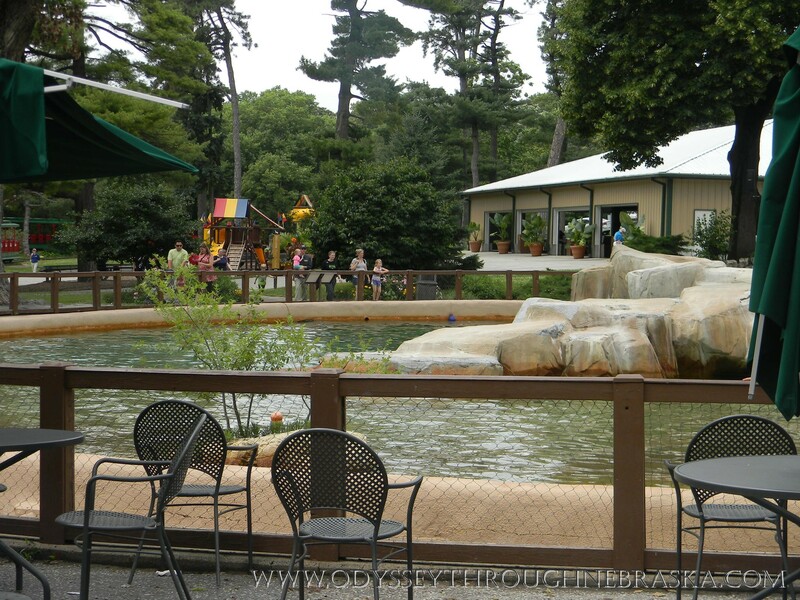 This zoo is definitely one of our family’s favorite places to visit! P.S. I have recently been honored to join a Midwest Travel Bloggers Group. The topic of the month just happened to be zoos. To learn about more great zoos across the Midwest United States, here is what you need to do. First, read this excellent post about the Walking Tourist’s Camel Ride at the Kansas City Zoo. At the bottom, links are included to all of the other June posts about zoos. This is great way to find out about other wonderful travel bloggers, as well other zoos around this area of the United States! 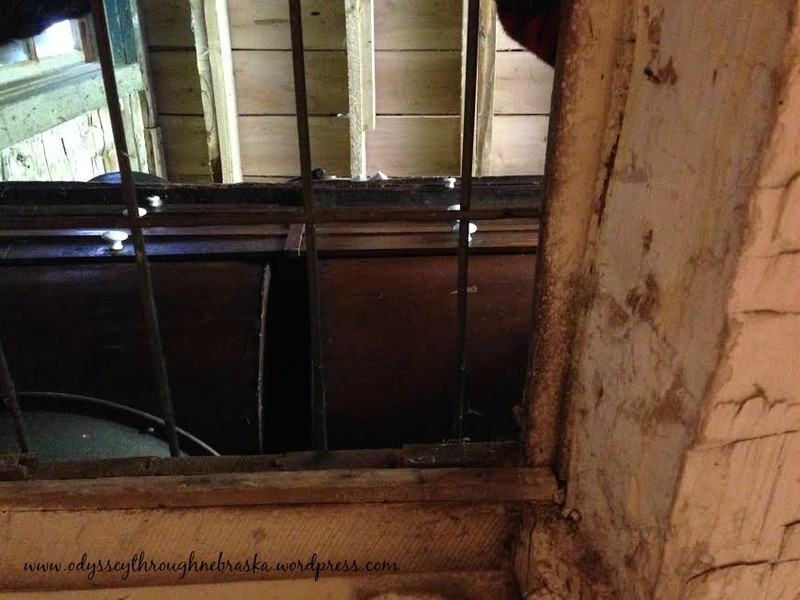 Underneath the original Mayhew Cabin through the cellar door you can climb into a cave. One that has been reinforced for safety and connected with a long winding tunnel to allow you to exit. I was sitting there waiting for my children to come back. My oldest had come down and offered to find the others. He started by looking through the cabin. Once I heard him walking around above me, the need for this place made me sense. While I knew who was above me, I was instantly filled with an unexplainable fear. The vent may have not been there originally, but it did add to the realism of the experience. My imagination took me to a place in time over 150 years previously. Being down in the cave, I suddenly realized what being a fugitive must have felt like. To hear the heavy thud of footfalls above that might mean discovery. Was the person friend or foe? One providing safety or capture that would lead to death or an even worse fate? Having to hide to preserve your very life and the life of your children must have been incredibly frightening. My children seemed to “get” slavery for the first time. They pretended to hide from me the slave owner. As we were the only visitors at the time, this worked, and thankfully they let me in on this game eventually. 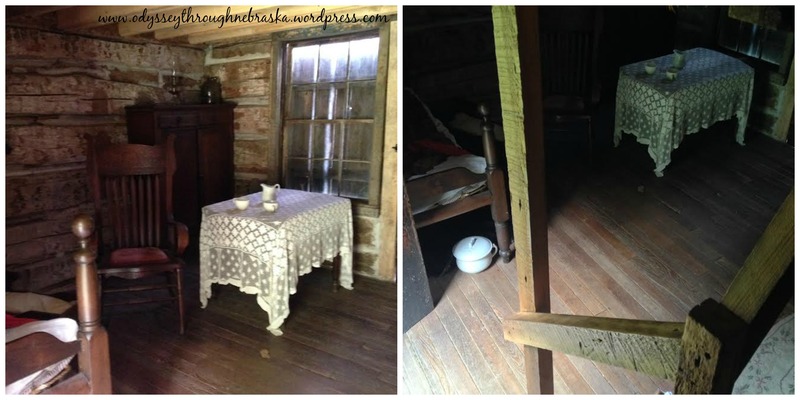 This cabin, cave and tunnel helped history come to life for my family! As you walk along through the damp and drafty tunnel, rooms have been chiseled out giving you an additional feel for what a fugitive would have experienced. 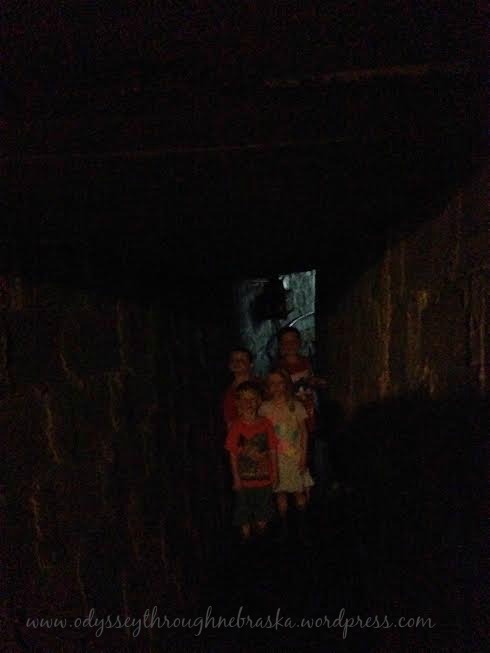 Beside the tunnel, the interior of the museum also gave us glimpses of slavery life. Including a black curtain closet with a plank ceiling where you could pretend to hide from the slave owners. While I was talking to the museum docent, my boys managed to silently hide there before I finally found them! 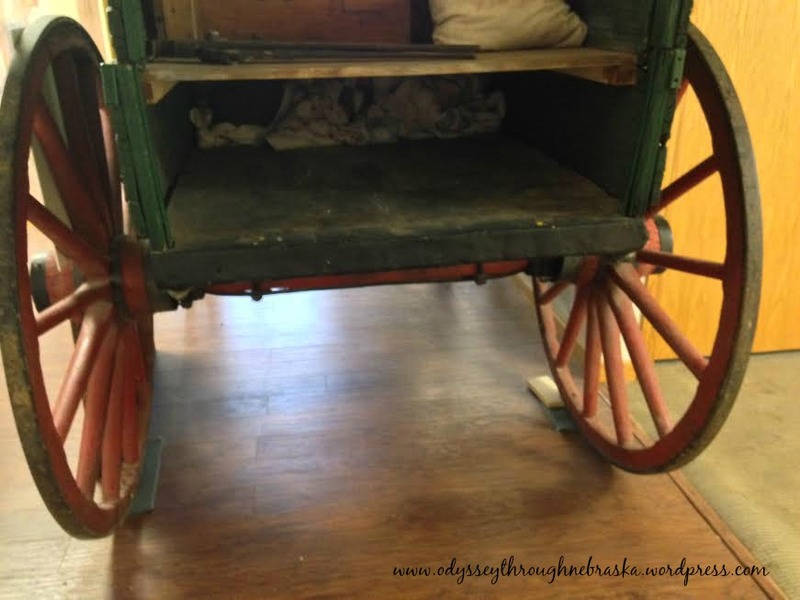 They also have a wagon showing a “slave” escaping in a wagon. Can you see the “person” hiding? They also have shackles that you can try on to experience the misery of not being free. Do you like my son’s attempt at a mournful expression? 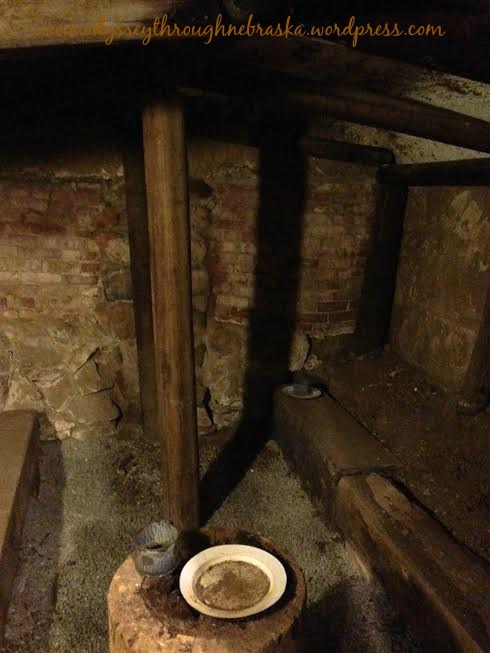 While perhaps this is not the largest or most polished of the recreated Underground Railroad Stations, at the Mayhew Cabin and John Brown’s Cave they do an excellent job at helping to bring history to life, especially for children. 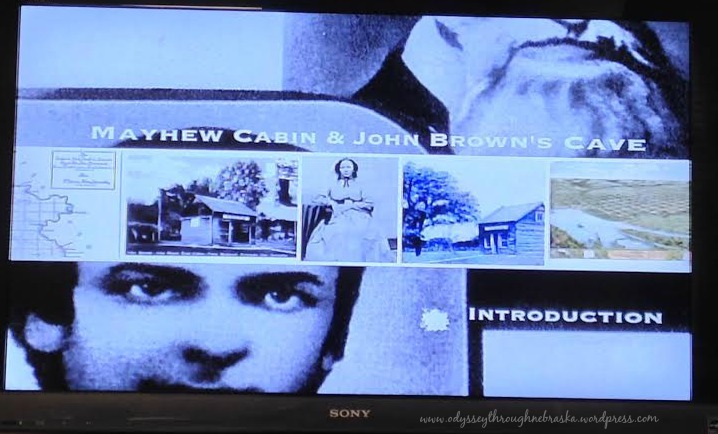 In addition, you can watch a short video, filmed by a Mayhew descendant, about the history of the cabin. 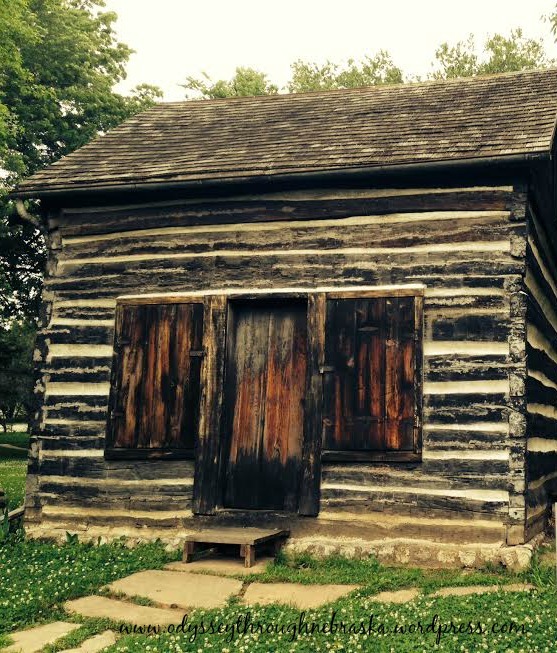 To learn more or to schedule a tour, please visit the Mayhew Cabin website. Note: this is one of the many fine places to visit in Nebraska City. To learn more about other Underground Railroad significant locations across the United States, please visit the Network to Freedom website. Built with stacked logs, the snug cabin is certainly not much to look at. Looking at the interior, comfortably housing one person almost seems like a stretch, much less the four people who stayed here. After relocating from Ohio, the Mayhew family called this log cabin near the Missouri River home. 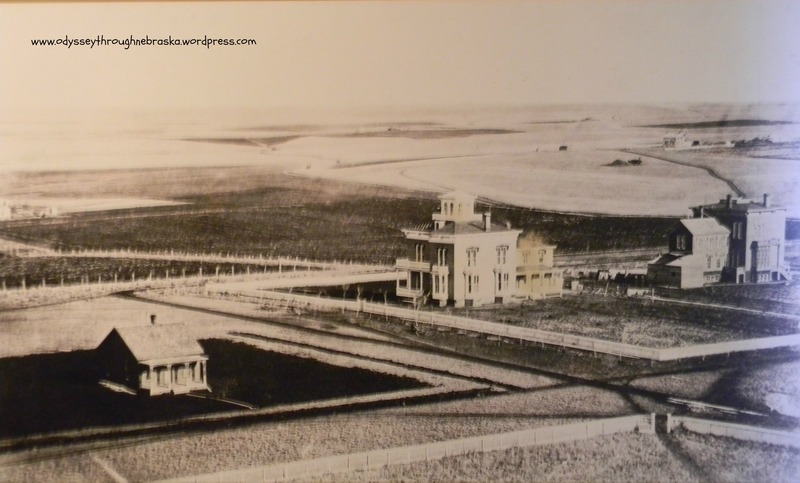 Nebraska City, part of then Nebraska Territory, was just starting to grow. Because of being located near Missouri, the town had one feature that set them apart from the other area locations. Slaves. Ten of them were noted on the census. This did not set well with Mrs. Mayhew. Or especially with her brother, John Kagi, who dwelt with them for several months. About this time, Kagi became a companion of John Brown. You may recognize him as the one who eventually led a raid Harper’s Ferry to make a statement against slavery. This event was a precursor that helped to catapult our nation into a Civil War. Before all this, Kagi was an active abolitionist and was doing what he could to help end slavery, including using his sister’s cabin as at least a temporary Underground Railroad Station. This is where his association with Brown causes history to be a bit fuzzy. 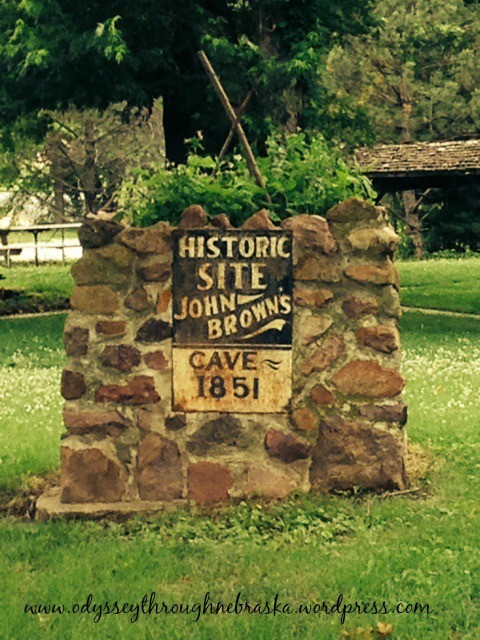 Some newspaper clippings tell of Brown visiting this site himself. Others imply that only Kagi was acting as the Underground Railroad Conductor. The name game does come into play here, and possibly the wrong man was given the credit. Rather than being called Kagi cave in honor of the man who definitely found himself at home there, the more notorious man gets the name of the cave. Was Brown ever even in Nebraska? No one is completely sure. Why? Being involved with the Underground Railroad was not exactly something a person would announce at the town square. Even after the Civil War, Southern Sympathizers were still around and many just wanted to move past the heartache. Either way, proof does exist that a group of at least one dozen slaves passed through the cabin at one point, at least long enough to eat breakfast. The exact details of what all happened are definitely sketchy. Yet I still feel that my knowledge of the underground railroad increased by visiting the Mayhew Cabin and John Brown’s Cave. Understanding the impact that Nebraska had on this network is also interesting. Tomorrow I plan on telling a bit more about this place, and the lessons that I learned. Why is this timing of this post significant? I mentioned in my post yesterday that June 19th happens to be an important holiday. Especially for the ancestors of slaves in this country. Juneteenth is the celebration of the announcement of the abolition of slavery in Texas. This celebration of freedom has caught on and spread to other states. Including Nebraska who hosted one event in Omaha earlier this week and will have celebrations in Lincoln and in Nebraska City tomorrow. The latter is the place where I will “take you” again tomorrow, exploring anew the part that Nebraska played in the Underground Railroad. Note: Unable to read the full review right now? Please skip to the end to find out about the special event happening in Lincoln TOMORROW (Saturday June 14th) regarding this book. If you want the article summary, I do highly recommend the book Lincoln’s Early Architecture by Lincoln authors Hansen, McKee and Zimmer. Reading books that connect the past with the present are always the ones that intrigue me. I relish titles that meld the distant past with current reality. This is the perfect description of the book that I am in the middle of enjoying. Normally a person should probably not suggest someone read a book that he or she has not actually completed. Yet I can recommend the non-fiction work, Lincoln’s Early Architecture, without reservation, even though I am only halfway through finishing. 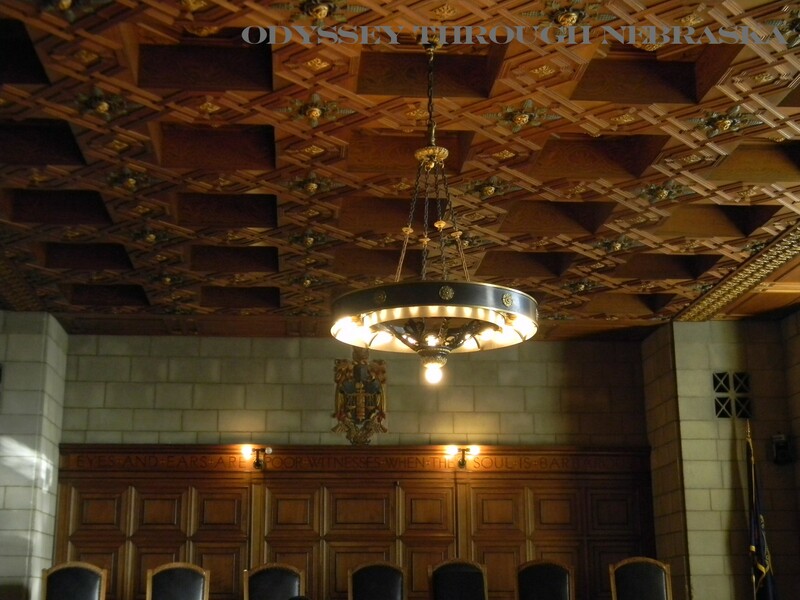 Lincoln’s Early Architecture is written by the “who’s who” of Lincoln historic building experts. Any one of these three men could have written a great historical Lincoln book on their own. In fact, a few of them already have published historical Lincoln books. By collaborating and sharing their own collections, the results are outstanding. 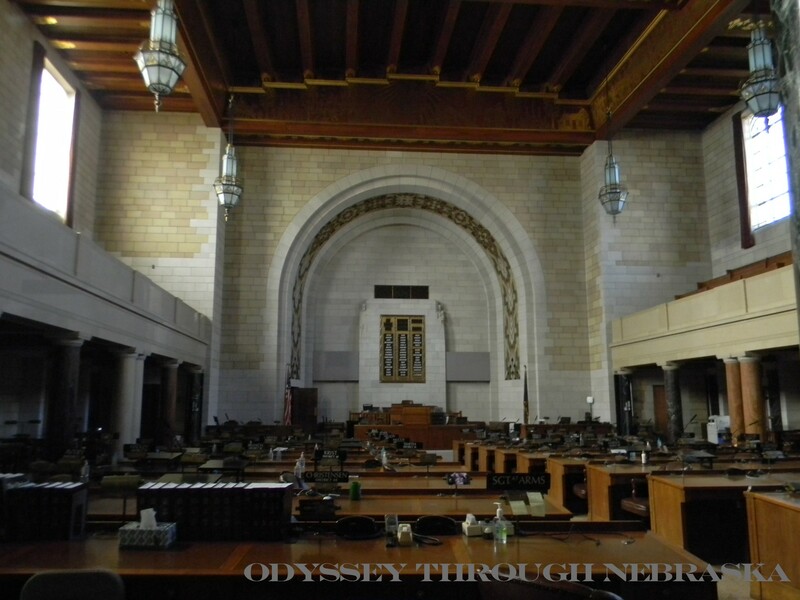 Matthew Hansen is a Nebraska preservation architect who has worked on restoring the Nebraska capitol. James McKee is a business owner and just happens to be THE Lincoln city historian. Edward Zimmer works as Lincoln and Lancaster County historic preservation planner. See what I mean on their qualifications? At only 127 pages, this book is not overly lengthy. Covering so many places around Lincoln, the information to be absorbed is rather extensive. Reading this book from cover to cover may not ever happen in one sitting for me. Using this book as a reference will happen repeatedly. In fact, I plan on keeping the title in my car for many months to come. I do believe I will have to convince my husband to drive me downtown more often – that way I can stare about in identification mode and not get into any accidents! Employing the use of historic photographs, the authors relay how Lincoln used to be. The result, for me, was a curiosity to know more. Reading about what was is a great starting point. Now I want to go to downtown Lincoln and see what still is. I took this picture of a picture inside of the still-standing Kennard House. So hard to believe that this was Lincoln’s humble beginnings. Of the buildings in this photograph, you can only visit the one. Several of the buildings are immediately recognizable to me just based on seeing the picture. Trying to identify many of the others is more of a challenge. Especially since the downtown Lincoln skyline is definitely a conglomeration between old and new. Thankfully the book does make a note as to which buildings are still standing. Many of these pictured structures have now been razed. Several for parking lots. This makes me a bit sad. Not all of the included buildings are found in downtown Lincoln. Places throughout the city are included for historical reference. This book answered a question that I had always wanted to investigate. What is the significance of the Indian statue in Pioneer Park? Other than knowing the name of the statue (“The Smoke Signal”), I always wondered why the statue is even there. While I believe a bit of this information is nearby the statue, the story was incomplete. By reading page 122 in this book, I finally know the full story behind the Indian! Evidently before Ellis Luis Burman Jr. made his mark in special effects, props and make-up in Hollywood, he was a Lincoln man. Hired as a sculptor to design several of the statues around Pioneer’s Park, this one is his most famous one. Weighing in at five tons and standing at fifteen feet, this depiction of Chief Red Cloud makes an impression. I know that I will enjoy learning more about Lincoln architecture past and present in the weeks to come. Getting your own copy of the book is simple. One of my favorite book stores in Lincoln, Indigo Bridge Books, is having a book reading and signing with at least two of the authors from 1:00-2:00. You can purchase a copy of the book at that location! Incidentally, snacks and coffee will be served. Come for the food and the story – go home with an interesting reference book about Lincoln. Definitely a worthwhile outing! Unable to attend? The book store will continue to have copies available, as do other book retailers. P.S. Thank you to Arcadia Publishing for providing me with a copy of the book to review. This would have been a title on my to-read list. By bringing the book to my attention, my knowledge of historical Lincoln will continue to expand. I will definitely be referencing the book again on this blog! This is one of my family’s favorite holidays. Besides Christmas and Easter of course and Memorial Day and Veteran’s Day. Maybe I should just say, this is a day that we definitely like to remember. We do like our donuts. 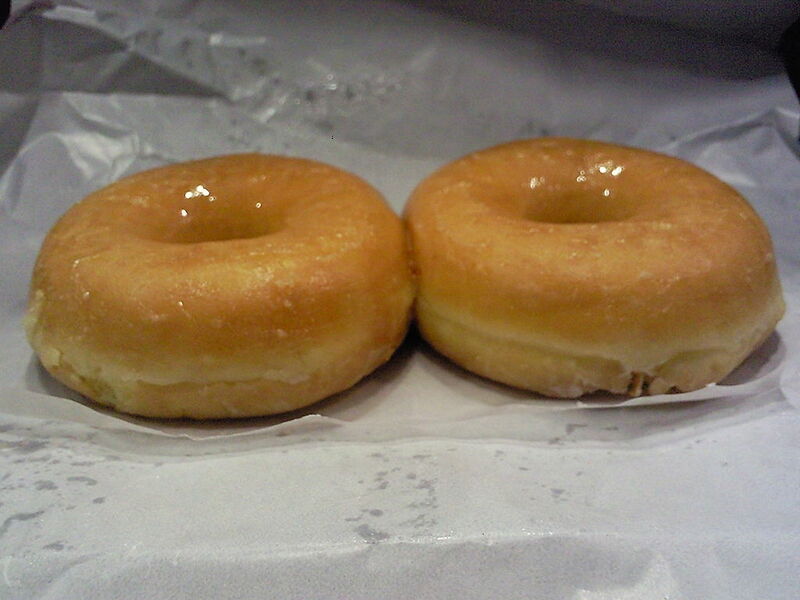 Taking six people out for donuts can get a bit expensive, so mainly we buy them when they are on sale at the store. This is one day that my kids get to go to our favorite donut shop (LaMar’s Donuts) and enjoy a fresh, piping hot morsel of deliciousness. Anyway, enough tangents. I was quite surprised to discover that there is actually a story behind “National Donut Day.” And the tale is meaningful one that involves two important organizations: The Salvation Army and our United States military. Almost one hundred years ago, across the ocean, soldiers in the French trenches were in need of a morale booster. So, Salvation Army workers began to serve them coffee and donuts. (That illustrates a level of bravery that is not normally demonstrated for those passing out pastries!) Now the workers were not there with that purpose. Their goal instead was to provide spiritual guidance and a connection with the memories of home. The donut was a visible symbol to them that someday peace would exist again, and home was not quite as far away as it had been before. Not until the Great Depression did “National Donut Day” illustrate the page of a calendar. At this point, the Salvation Army wanted everyone to know about the great work that they were doing in providing service to the community. In 1937, the world was on the brink of another war. Our country needed to recognize the importance of working together for a cause. What a better way to remind everyone of the value of service than by celebrating with donuts? 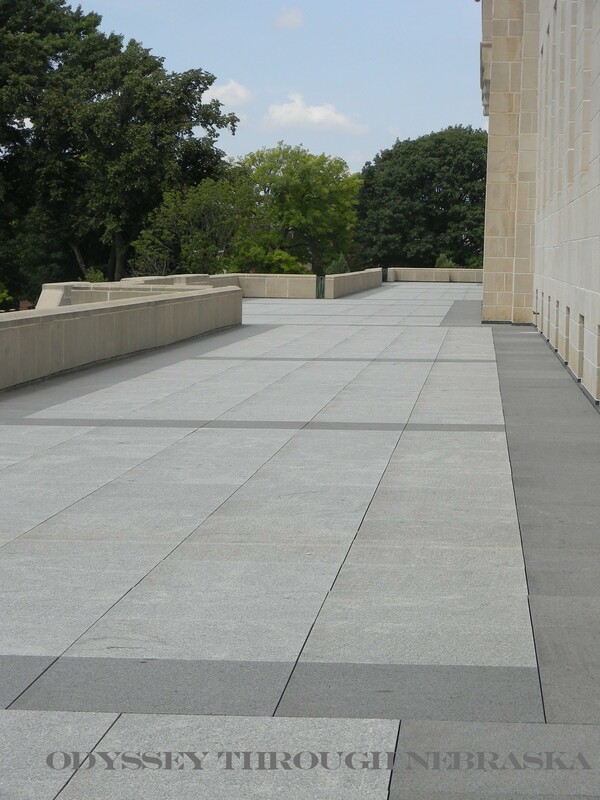 A visual representation of how many had selflessly taken care of others on battle fields far away just twenty years prior. This “Donut Day” has continued to be an important holiday A way to remember all that the Salvation Army has continued to do, for the past three-quarters of a century, to make a difference in other people’s lives. In fact, I learned all of this information from The Metropolitan Division of the Chicage Salvation Army. On their website, they have many additional fun and fascinating facts about the history of Donut Day. This one was very interesting to me. Here is a short video that you can also watch to learn more. Now that you know that “National Donut Day” came about due to historical events, you have all the more reason to celebrate. Many of the bigger national chains are giving away free donuts. I know that our local grocery stores are giving free donuts to so many customers and then giving out discounted ones as well. A yummy holiday and a great day to remember those who serve! P.S. On a more serious note, today is the anniversary of the D-Day Invasion. 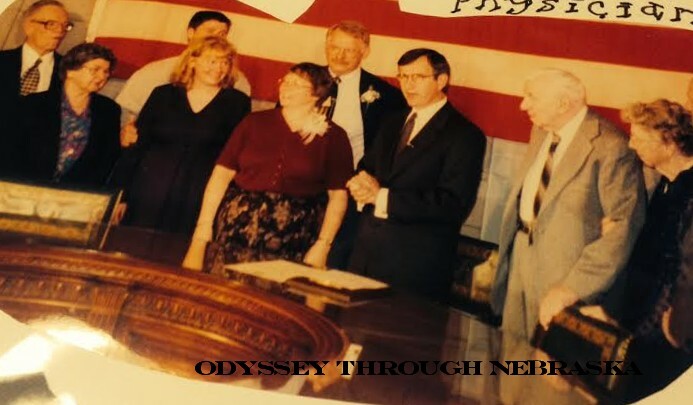 A cause that involved many Americans, including Nebraskans. I do not believe you can say this word enough to veterans: Thank you! P.P.S. One our other favorite doughnut places, The Doughnut Hole is having specials and a drawing for free doughnuts tomorrow. They are also revealing a brand new flavor! You will want to arrive EARLY – they will sell out! A birthday party for a building? Perhaps this is not commonplace. Yet as you learn the story behind the grand place, you might just understand why. Once upon a time, the town was Athens. 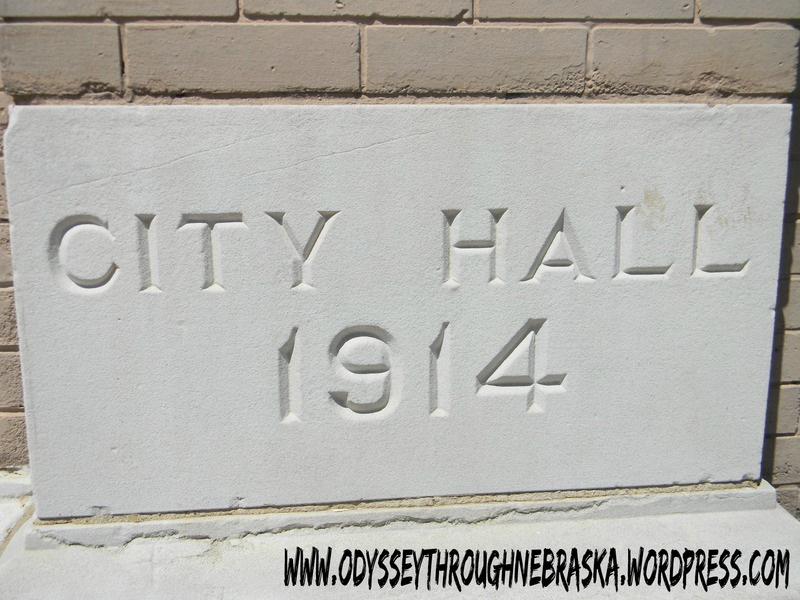 Yes, we had an Athens in Nebraska before 1889. Then that post office became University Place in honor of Nebraska Wesleyean University which had been founded the year before. Fifteen years later (in 1914), they decided this primarily Methodist town needed a new town hall building. The two-story building housed the fire and police departments as well as all city offices with an auditorium, council chambers and fire department day room. The town grew and became a bustling place of 5,000 people. Nearby Lincoln took notice and annexed them in 1926. 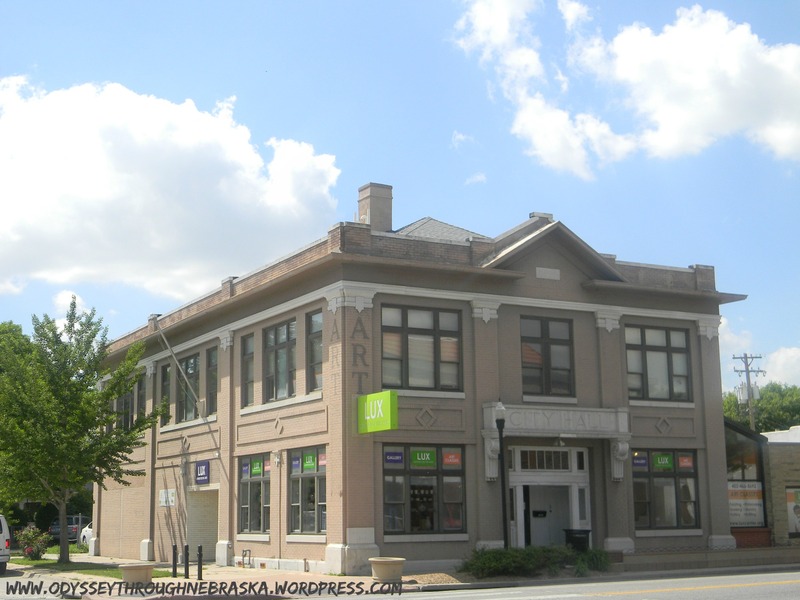 What to do with a building that was the city hub for a town that no longer exists? Well, the building has served various purposes including a fire station and a restaurant. Until in 1985, when it was purchased by Gladys Lux. Now this lady has quite the history of her own in the community. For forty years, Lux had brought her appreciation and abilities in the arts to Nebraska Wesleyean and the University Place area. She must have been a fascinating woman – I enjoyed reading her story on the Lux website. Her vision was to bring a community arts building to this section of town that she loved so well. So to celebrate this place of community that existed in University Place, before the city of Lincoln itself was even part of the equation, is fitting. Lux Center for the Arts is having a big birthday celebration THIS Sunday June 1st from 1:00 to 4:00. Yes, cake and ice cream is most definitely involved. This will be a part of their annual summer Community Arts Celebration. You will not want to miss this event. 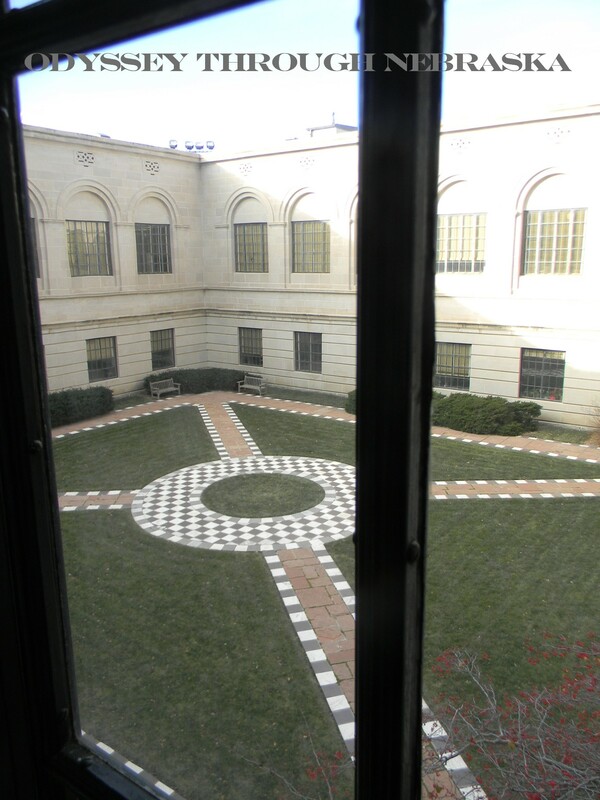 Especially the opportunity to become your own part of the University Place City Hall history. P.S. A little later on today, I plan on giving you a sneak peak into one of their current exhibits whose theme relates to this website! Gallery. Studio. Workshop. Display Area. Museum. Boutique & Gift Shop. Gathering Place. 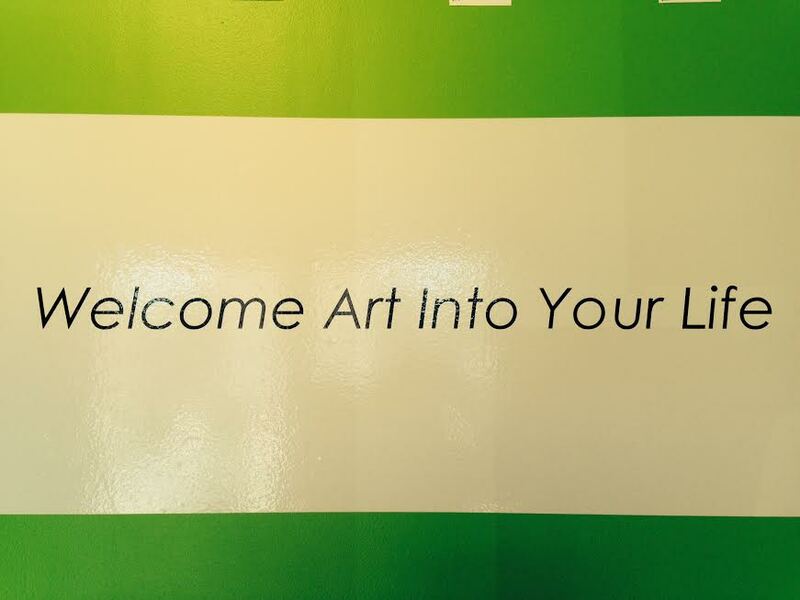 All of these describe the Lux Center for the Arts. And that is exactly how they like it! 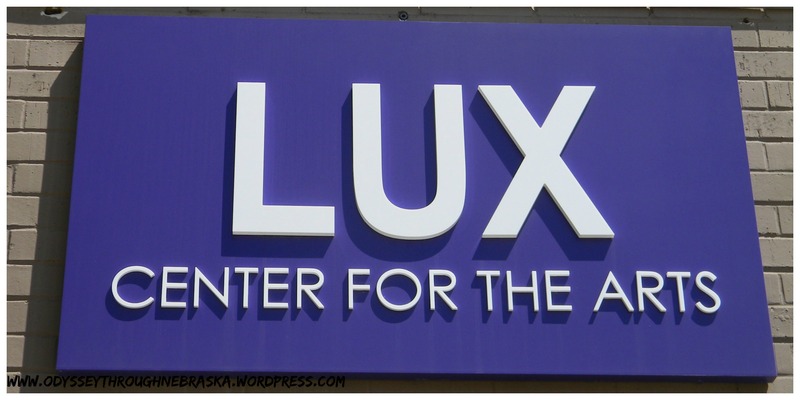 We first discovered the Lux Center as a part of Lincoln’s “Be a Tourist in Your Own Hometown” program. We have attended a family event or two as well, and I wish that we made it back there even more often, as they present so many great family events. According to Christine Hunt who happens to be the Community Director of Involvement, the heart of the Lux Center for the Arts is just that: community. They want the community to come inside to see their changing exhibitions. Even more, they want families and individuals to be a part of creating their own art through workshops and classes. Beyond this, the Lux Center staff go outside the building to provide outreach to those who cannot attend classes. To the shut-ins, elderly or even incarcerated patrons, they want to give the gift of art. So, some of the artists bring a studio to those who cannot travel to one. Children’s Classes and family adventures are available, as well as summer camps. Including date nights and “girls night out,” class opportunities abound for adults as well. Pottery, jewelry making, painting, drawing: you name the artistic medium, and you may very well find it at Lux Center for the Arts. Tomorrow I plan on telling you all about a special celebration that is happening there this week-end, as well as one of their current exhibits that has to do with Nebraska. Next Tuesday is the beginning of the Nebraska History Museum’s History Hour for Kids. 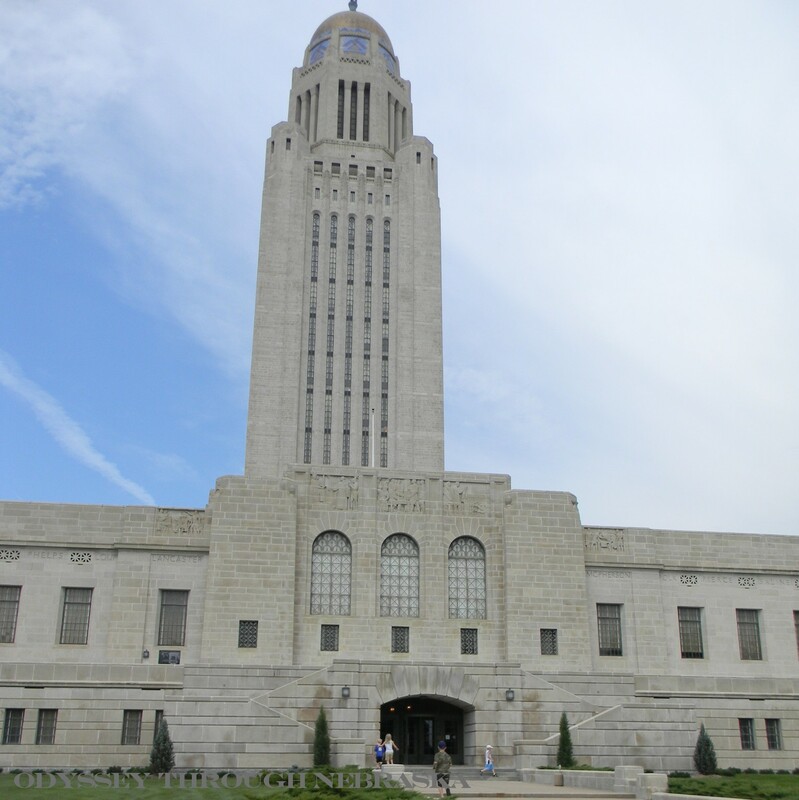 The day after Memorial Day and the following ten weeks from 10:00 to 11:00 on Tuesday mornings, you can attend a free kids event at the museum that correlate to various Nebraska topics. We are really excited about these as they will add to what we have been studying all year! To take a look at the themes, click here. 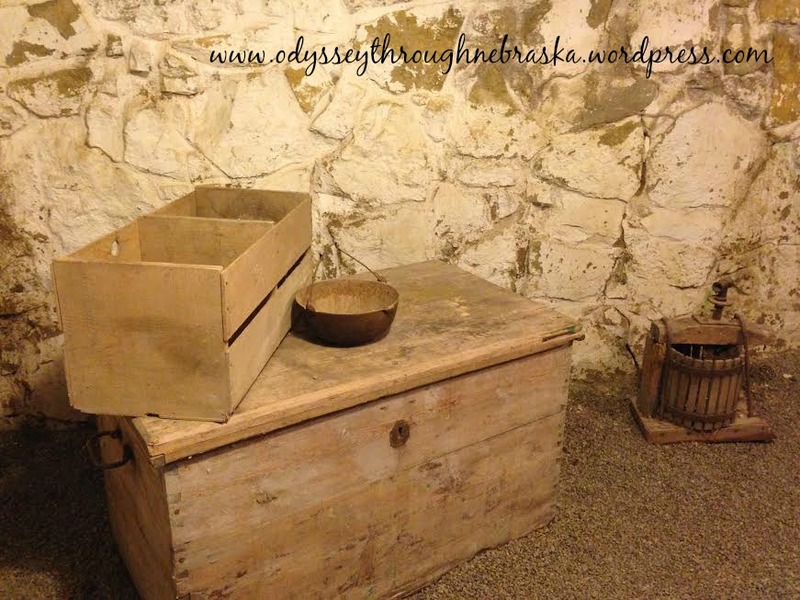 Here are the details you need to know to visit the Nebraska History Museum. 1 – 4 Each day the museum is open. Pass the Nebraska football stadium on your left, then turn left on P or O Street. Proceed six blocks to 15th Street, (Centennial Mall).